WASHINGTON — The president of Brazil made an unusual visit to CIA headquarters and later spoke of his admiration for the United States on the second day of a trip that reflected his country’s shift to a more pro-American stance. President Jair Bolsonaro, a far-right politician who succeeded a leftist who at times had a frosty relationship with the United States, arrived in the country with a half-dozen ministers and a goal of expanding trade and diplomatic cooperation between the two largest economies in the Western Hemisphere. He was expected to meet Tuesday with President Donald Trump to discuss a range of issues, including ways to increase U.S. private-sector investment in Brazil and ways to resolve the political crisis in Venezuela. “Nowadays, you have a president who is a friend of the United States who admires this beautiful country,” Bolsonaro told an audience at the U.S. Chamber of Commerce on Monday. 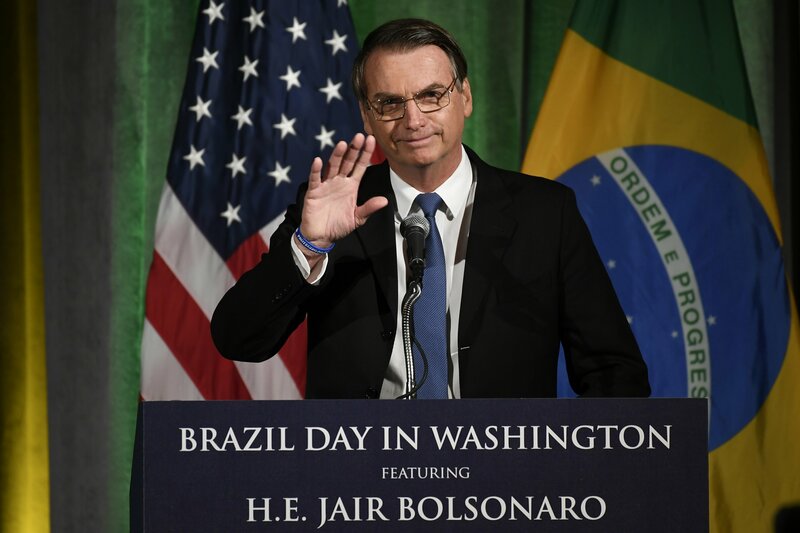 Bolsonaro underscored the difference between his administration and that of former President Dilma Rousseff by stopping by CIA headquarters in Langley, Virginia, to discuss “international themes in the region,” according to his son, Eduardo, a Brazilian lawmaker accompanying him on his first bilateral overseas trip. Eduardo Bolsonaro described the CIA as “one of the most respected intelligence agencies in the world,” in a tweet that was likely to raise eyebrows back home in Brazil, where the U.S. and its spy services have been regarded with suspicion in recent years. In 2013, leaks from Edward Snowden revealed that the National Security Agency had wiretapped conversations of Rousseff, leading to several years of tense relations between the U.S. and Brazil. The far-right Bolsonaro was elected last year and is an admirer of Trump. He sought to underscore his pro-America stance with a tweet upon his arrival Sunday. Bolsonaro’s insurgent candidacy against the candidate of Rousseff’s party has been compared to Trump’s victory in 2016. The Brazilian president made the comparison himself in his speech to the Chamber of Commerce, describing how he has had to contend with “fake news” and tough coverage from established news organizations. “We want to have a great Brazil just like Trump wants to have a great America,” he said. The speech came after the two countries signed several bilateral agreements, including one that allows the United States to use Brazil’s Alcantara Aerospace Launch Base for its satellites, and Brazil announced an end to visa requirements for U.S. tourists who visit the country. Brazil is seeking U.S. help with its efforts to join the Organization for Economic Cooperation and Development and to expand trade. The Bolsonaro administration is seeking to reduce public-sector spending and privatize state enterprises to reduce debt and grow its economy. A senior U.S. administration official noted that the U.S. does have a $27 billion trade surplus with Brazil and that there are opportunities to bring the nations’ business communities closer. He said there are expected to be new initiatives on energy infrastructure. The official, briefing reporters on condition of anonymity, noted that Brazil has a close relationship with Venezuela’s military and may be able to serve as a go-between with the security forces that continue to support Maduro. Brazil, like the U.S., has recognized the leader of the National Assembly, Juan Guaido, as Venezuela’s interim president under the argument that Maduro’s re-election last year was illegitimate. Associated Press writers Mauricio Savarese in Madrid and Kevin Freking in Washington contributed to this report.